Over 19.5 million people commute by bike every day. Yet, nearly two thirds (65%) of Americans who don’t bike say they would like to ride more often. What does it take for these people to get out on their bikes? A secure place to store their bike at their destination. One of the best and most direct ways is simply to ask—believe it or not employers are usually open to employee suggestions. Request bike parking by either dropping them a note like the one below, or just sitting down and talking with them. For a stronger argument, you may want to do some research within your company to find out if other employees will support your cause—there’s power in numbers. You may even want to develop a locker user waiting list. One or two requests usually aren’t enough to prompt executives to take action, but if you get enough people to express their support, they may at least consider it. Bicycling is the least expensive mode of transportation. Each and every car parking space costs the employer, on average, $10,000 in design, construction, maintenance, property taxes, and site insurance. Nine CycleSafe bike lockers can fit into one car parking space—enough parking to hold eighteen bikes! What’s more, some areas offer tax breaks, and recent legislation allows for as much as 95% of bicycle or pedestrian projects to be federally funded! 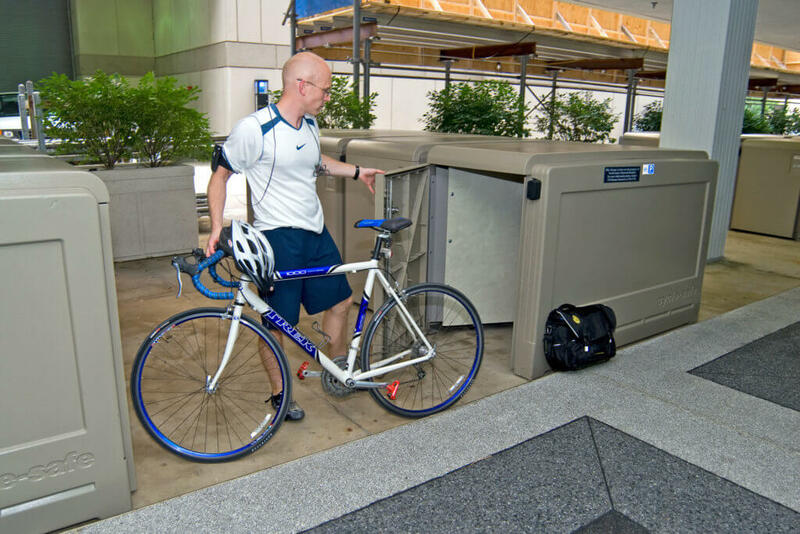 Find out what other companies in your industry are providing their employees with secure bike parking, or similar types of amenities. Employers are more likely to add a benefit if competing companies already offer it, otherwise they will be left behind when they are looking for new employees as many young professionals imagine secure bike parking as part of the ultimate job package. Employers frequently pay for employee automobile parking, company cars and mileage, so why shouldn’t they provide bike parking as well? According to the IRS, operating a car costs 54.5 cents per mile, on the other hand the cost for operating a bike is estimated to be a 42 cent societal gain per mile. What’s more, employers may be eligible for some of the vast amount of funding that is available for bike and pedestrian projects, requiring them to spend little or none of their own corporate funds to install CycleSafe bike parking. The federal government and some states also offer parking cash outs as an incentive to bike to work. CycleSafe’s bike parking products can also add valued points toward a buildings LEED certification, as well as for Bicycle Friendly Businesses by the League of American Bicyclists. Check out our Sustainability Commitment page to find out more about what CycleSafe is doing for the environment. Does your organization have a spare room, or unused space in a parking garage for bike parking? If so, perhaps you can convert it into a secure space for bike parking. Our specialists are experts at configuring bike rooms and maximizing their potential. Talk to one of our bike room design specialists today.